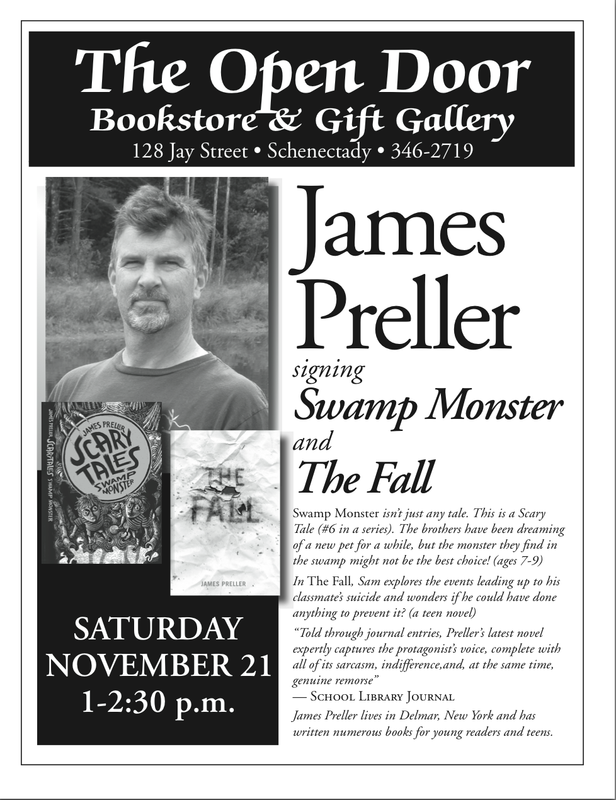 Book Signing at the OPEN DOOR Bookstore in Schenectady, Saturday @ 1:00, November 21! The flyer below gives you the facts. Now for the honesty: Bookstore signings, for me, tend to be sad, dispiriting affairs. For the most part, nobody comes. I know I’m not the only author to experience this particular form of awfulness. Sitting there at the table, waiting, expectations low. I understand completely. Your lives are busy, the world has changed, it’s always at a bad time on the wrong day — and the fact is I’m just not that big of a deal (except for in my own mind, where I’m amazing!!!!). Once in awhile, mostly as an act of good will & optimism — along with the gratefulness that comes with simply being invited — I say yes. And occasionally a scattered few do show up. A shy, young reader awkwardly arrives. We talk for a while. I sign a book, we take a photo, shake hands. And there for a few moments we achieve one good, pure thing in this shattered world of ours; it feels worthwhile, the coming together of a writer and a reader. True fact: I love to meet young readers. Book lovers. It gives me hope, makes me happy. Maybe it makes a small difference to somebody. At the very worst, I get to sit in a bookstore for an hour and a half. There are worse places to be. About these two books: THE FALL can be seen as a companion to BYSTANDER, deals with the fallout from cyberbullying, and is best suited for grades 6-up. SWAMP MONSTER is the 6th book in the “Scary Tales” Series, grades 2-5, and it’s simply a fast-paced, easy-to-read entertainment that even a reluctant reader can enjoy. I feel exactly the same way about book signings. You nailed it with the word “dispiriting”. I say yes once a year or so, usually to the local indie bookstore, but always wonder if they’d rather I say no. Recently, a bookstore owner gently informed me that it’s the author’s job to go out there and help whip up business, but I think the truth is that unless you’re wildly popular, even your friends aren’t going to come to your book signing unless they happen to need something (else) to read. My only successful book signings occur when I happen to speak to a large captive audience and do a signing immediately afterward.